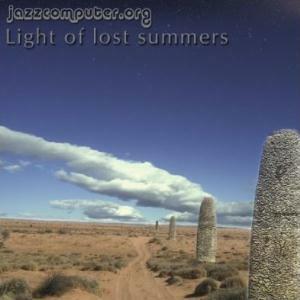 Light of Lost Summers (2007), JAZZCOMPUTER a.k.a. Yves Potin's album has a fair share of very interesting musical proposals that tend to blend really modern electronics with a kind of sometimes imaginative "New Age Jazz", but then again sometimes with a quiet "cliched" version of modern "mainstream" Jazz..
Ironically, the best parts of the compositions are those which are closer to the prog/electronics of nowadays, the infamous "Ambient" tagging . Surrounding himself with many instruments from various parts of the world (Udu, Koto, Harp, Tablas, Timpani, Nagadas and guitars. ), which he combines with "spacy" synths. So there are some heavy electronic thunderstorms alongside and simultaneously counterpointing some mellow or melodical Jazz structures. To sum it up, great electronic moments, composition wise and also more than once he gets the blending to sound daring, but on the other hand, the constant appearance of corny Jazzistic melodies or soloings spoils the whole fun. ***3.5 " Promising without doubt, but still on the making" PA stars. Post a review of JAZZCOMPUTER.ORG "Light Of Lost Summers"